A car leak can turn a perfectly good morning into a stress-filled commute. It happens: cars leak and leave mysterious puddles on the ground that leaves us wondering if something’s wrong. The good news is that you don’t need to be a Master Mechanic to be a master at identifying those mystery spots. Cars don’t have too many fluids that commonly leak, and if you know what you’re looking for, you’ll at least be able to distinguish between a harmless drip and a severe problem. There are three things to consider when it comes to those car leaks: colour, consistency, and location relative to your car. Some car fluids look similar, so their position will tell you a lot about the problem. The easiest way to do this is to place newspaper under your car in the evening and check it in the morning. This way, you can distinguish between power steering fluid, a reddish or light brown, from the front of the car, and auto transmission fluid (also often reddish or light brown but dripping from the middle of the vehicle). Brake fluid is one of the most dangerous leaks to worry about, and although rare, it’s crucial everybody knows how to identify it. If you see that clear to brown puddle under your car that is extremely slippery to the touch, don’t even think about driving! Get it towed right away. Below we break down six fluids that most commonly leak from cars, how to recognize them, and what steps to take. Remember, these are general fluids that are seen in most cars. 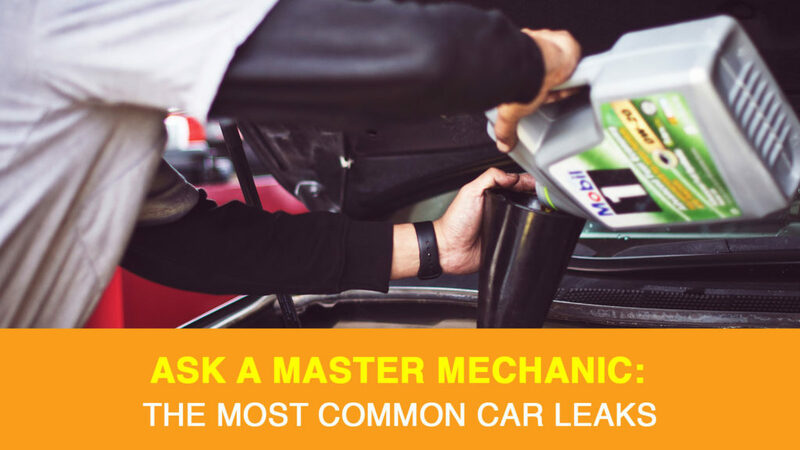 Your car’s fluids may vary, and if you don’t know what a leak is, it’s always best to contact your local Master Mechanic to book an appointment. Let’s start with one of the most common leaks you’re likely to see in your driveway or parking spot. An amber-to-brown/blackish colour spot is a telltale sign of motor oil. The good news is that a little drip is relatively standard and isn’t likely cause for concern. You don’t need to call a tow-truck, but it’s probably a good idea to book an appointment with your local Master Mechanic to track down the cause. The last thing you want is for a little leak to become a more significant problem. Sometimes transmission fluid can resemble engine oil but is thicker and usually found near the centre of the car, instead of the front. Many car transmissions today have a reddish fluid that’s thinner than oil, which is a little easier to distinguish. These drips may come from a failing transmission seal or gasket, so it is a more serious issue that requires attention. It’s best to check your levels, replenish them if they’re low, and then schedule service at your local Master Mechanic as soon as possible. Here’s where things start to get a little tricky, and you’ll want to pay closer attention. Your power steering system may use a fluid that’s identical or similar to your car’s transmission fluid. Tricky, right? We told you so! To understand the difference, you’ll need to check the position of the leak relative to your vehicle. If they’re around the middle of the car, the transmission is probably to blame. If the leak is closer to the front, then it’s most likely coming from your power steering. If you think your power steering fluid is the culprit, it’s important to react quickly, repair any leaks and refill it again. Running a power steering pump without oil can cause damage to your car that will cost a lot more if left unattended. This is arguably the most important fluid in your car–for obvious reasons. New brake fluid is mostly clear, but over time can turn brown in your engine. You can quickly identify a brake fluid leak by its extremely slippery characteristics and location on the car. If you find any fluid near your wheel, it’s a sign of a leak and your car cannot be driven. Call your local Master Mechanic to have your vehicle towed and looked at right away. When dealing with your brakes, it’s always better to be safe. Coolant is by far the easiest fluid to identify. Any brightly coloured liquid leaking from your car is coolant! It’s not strange for older cars to occasionally blow off a little coolant when the engine overheats. If you have an older car, and spot a coolant leak, it could be time to top up your vehicle. Newer cars recycle blow off coolant, so you shouldn’t see any fluid. If you do have a newer vehicle, a bright-coloured stain under your car could indicate trouble under the hood. It’s best to book an appointment with your local Master Mechanic to get things looked at as soon as you can. If you see water, don’t worry! During summer months, condensation builds up on your air conditioner. It can cause a puddle of water to form under your car, but it’s completely normal and harmless. If you have any doubts about indentifying a fluid leak, it’s always better to be safe than sorry. Call your local Master Mechanic and describe the issue to us. We’ll advise you on next steps and can send someone to tow your car if you can’t drive.